We maintain a goal of consistently serving our patients with the level of care that helps them achieve long-lasting health and beauty. We are very pleased that, most often, those patients who remain under our care after initial procedures require no further treatment. Occasionally, people move and must receive care in their new city or state, which is just one reason we are always happy to welcome new patients into our family. Our office is pleased to offer the unexpected – Spa Services. Our clients enjoy the option of having paraffin wax hand treatments and aromatherapy during their appointments. Sometimes little things make all the difference in your comfort. Would a glass of merlot, chardonnay, or wine be right for you or would you rather enjoy a fresh cappuccino or fruit juice? How about a relaxing chair massage, CD headphones, or a scoop of Ben & Jerry’s Ice Cream? We understand that, for many children and adults, the mere thought of an upcoming dental visit can be upsetting. To accommodate as many patients as possible, our staff takes an extra gentle approach to dental care in a spa-inspired environment. Nitrous Oxide, a relaxing gas sedative, is a complimentary treatment service. Just let us know you request its use. IV Sedation serves as reliable source of deep conscious sedation for lengthy or more complex forms of treatment. If this is needed, we work with local anesthesiologists. 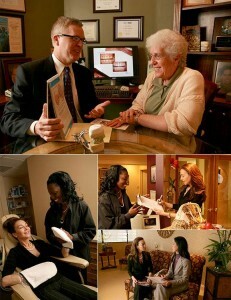 * Patients of all ages benefit from Drill Free fillings provided by micro-air technology.